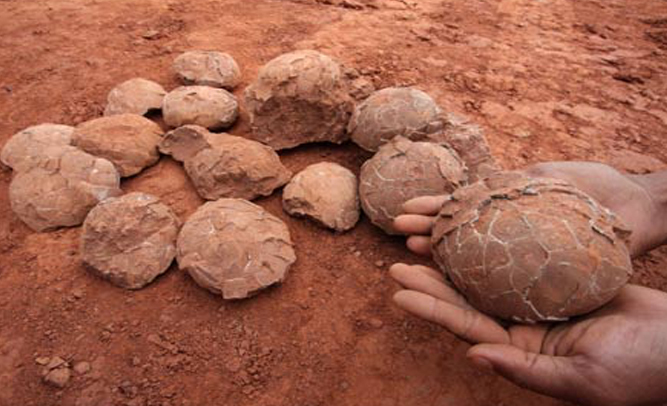 A group of road workers in Heyuan, China unearthed a section of cement that had several fossilized dinosaur eggs in it yesterday, and reports indicate that they used the eggs as part of a giant feast and celebration they were having for completing the new section of road. Lee says that they photographed the eggs and gave several broken pieces to local researchers. The whole, unbroken eggs they took home to cook and eat. Heyuan has been called the “Land of the Dinosaurs,” after more than 17,000 fragments and fossils have been found in the area since 1996.